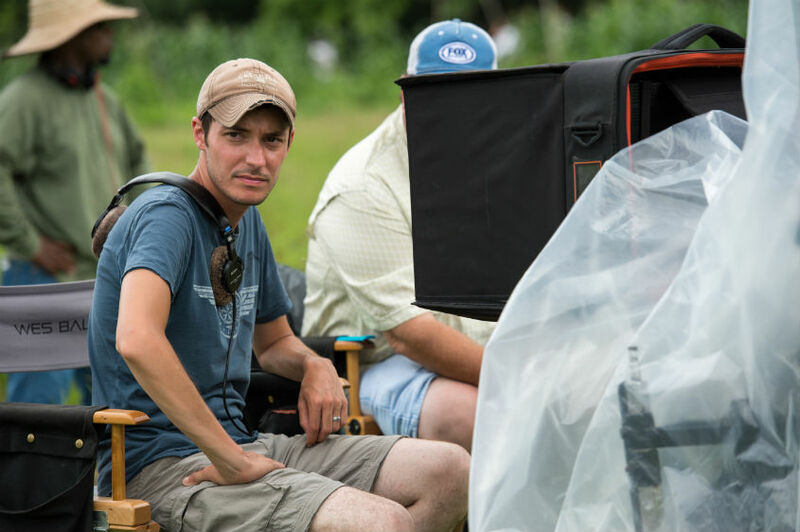 Das Interview mit Regisseur Wes Ball zu MAZE RUNNER: DIE AUSERWÄHLTEN IM LABYRINTH führte Patrick Möller. Es ist zuerst bei TMSB erschienen. Patrick Möller berät Unternehmen, Agenturen und Kreative bei Transmedia Storytelling Projekten und rund ums Experience Design. Er ist Mitbegründer des Netzwerkes Transmedia Storytelling Berlin und der Agentur imaginary friends. Patrick Möller: My first question is about that immersive system that makes use of two sidepanels attached to the main screen which is available in some of the theaters in the US and in Belgium. Can you tell us some more about that? How does it work? Wes Ball: Basically Barco is experimenting with this new format. I intentionally wanted to shoot the movie for widescreen, to really give you the feeling of beeing trapped in this world. So they were talking about their stuff and we together thought that we could do some of the Maze Runner stuff with that, too, and it could worked really well to bring to live this immersive and crazy world. So we did some kind of experimentation with solids and stuff that we thought were cool and they worked very hard on converting it so that a couple of minutes of that are presented in that kind of arena during the movie. So as you said, it this immersive system is used just for some minutes during the movie or is it finally being used all the time? The ultimate goal would have been to use it for the entire movie but there was no way to do that probably in time. So right now it is about 12 minutes or so of the movie. It is all set like a regular movie and when the scenes come in, the curtains reveal the panels quietly and you get immersived in that world as if you were running through the maze. I’m really looking forward to experience that immersion here in Germany as well. It is a great experiment right now and when we see people respond to it well, then I think we can do it in a much bigger way. We came to this thing after shooting the movie, but when you are shooting it straight away, there is much space for final decisions. How about the descision shooting the movie in 3D? Was that an idea that was allready there from the beginning or did that come up in the talks with FOX? I never really thought of 3D in the first place this is my first movie. I did not want to have another challenge. So actually I kind of thought of not doing it in 3D – to be able to work fast. The whole process of shooting a movie in 3D is pretty time consuming. As the story of the book and the movie is set in a dystopian future or maybe not so distant future, let’s focus on that a litte. Why do you think those dystopian stories are getting more and more influence or why are they brought to the movies more often over the last few years? I think that movies and stories tend to go in cycles, right? There is a set of period after period where there is something in the Zeitgeist; something in the audience out there so they want to see those stories. And of course we are tapping into the things that they find interesting. Actually there is something going on which is kind of a trend. People are unsure about the world around them – especially young people. And I think that is why there is this kind of pull to that kind of stories about worlds that need to be fixed or where there need to be some problems solved. So I would say that is the obvious thing but I would not say that about Maze Runner we are really not so much in a dystopian world throughout most parts of the movie. We are not even close to a post-apocalyptic theme until – which is a spoiler – to the very end of the movie. All we see first is this strange environment where those kidnapped survive and they created this cool society and they have done a pretty good job of working together and establishing rules and order and have a way of life together that gets upset when Thomas arrives being followed by Teresa. So it is another one of those dystopian stories but it is done in a very unique way. … exactly. He is the one in the book and we wanted to make him very well grounded in the movie where you even not agreeing with him could understood him. He wants to protect what they have built. That is all he cares about. That goes along why he hated Thomas. For him Thomas seems to be a thread to their status quo and for what these kids adopted for themselves. So when you compare the movie to the book, what kind of things did you have to change or make them work in the movie that were told in the book in another way? There were some specific things like the thought-talk between Thomas and Theresa as it is done in the book. It was pretty clear early on that this would not make it into the movie. It would have been to difficult to use some kind of visual language only to show something that is not visual at all, that the two of them could communincate with each other just by thinking about it. We could visualize their dreams instead. There were cut off just some little things, the beetle-blades for instance. I actually did shoot a scene with those but when we were putting the movie together it was just too much. There is this crazy world and on top of that is the labrinth with those evil mechanic things and so adding the beetle-blades would have kind of ruined the experience finally. It would have gone too far and so we decided to cut these things back and focus on the mystery that they don’t know where they are and not seeing any technology until they find a way out of the maze actually. But I think that when it comes to favourite scenes from the book that you will find a lot of them in the movie and we already got a lot of thumbs up for that. That’s true. When I watched the movie, I recognized so many scenes from the book and it felt like a really great experience to me. For me this was very important. I wanted the (existing) fans (of the books) to be proud of the movie and happy with it. And secondly I wanted to creating new fans with it. How do you see the situation in the movie that it is mainly about the male gladers and there are no (except for one) female gladers? We have seen so many female protagonist movies lately, The Hunger Games, Divergent and a lot of the other young adult things. They are allways kind of female centered and I think what separates them is that world is kind of adventerous, kind of fun. And I am surprised that either girls love it because there are pretty boys to look at. And even when Teresa shows up and her character gets introduced, there is no real romance, you know. She basically becomes one of the group. And from that point on we get the basic ground for the movie to see the real relationship between Thomas and her further. So it is a movie that kind of set for a much larger story. And so we kind of treated that way even with the characters. We are really seeing the first steps of these characters which we hope we can explore further in the next one. Even if it is a young adult book/movie, some of the scenes depicted play a lot with our fears. Take the scenes with the griever for example. Do you think that the book and the movie are really made for a young audience? I think so and I will tell you why. There is no gore, there is no blood in the movie except for one scene and you know which scene I am talking about. So for most parts of the movie we wanted to level the audience’s imagination. I think kids like to be scared. It is kind of movies that I grew up on. And I think that kids like to be treated as adults. They don’t want to deal with highschool issues they prefer to see kids making adult decisions. So I think that kids can take it and appreciate it. While ten year olds would love it, their parents would probably be worried about some scenes but everyone above that and especially 12 and older is okay with that. We don’t have to ‘baby’ our kids too much. Sure, it is a perfect balance between scary scenes and seeing the kids acting in an adult, organized way. So when you watch the movie you are also driven by the goal to find out what the secret is behind everything. I can’t wait for … We are actually working on the sequel right now. We will start shooting probably in two months. A lot of the crew is coming in today as we speak actually. I am on a location scouting right now. So we are hoping that this one will work out well and make some new fans so we can go on work on the second part which will be way bigger since it does take place right where the last one went off. We are going through the questions that came up in the first movie and see how they can be set in the second part now. It was great to do the first one and we are all looking forward now to do the sequal. And of course we have to think about the setup for the third movie and all the arrangements for that in the second one. Can you tell us about one of your favorite moments during the filming of the movie with this new cast? That’s a good question. I love the cast. I think it is a fantastic cast and there are a lot of newcomers as well as guys who have been doing things like this for a while. They are so professional and talented. We all had such a good spirit in doing this together. I don’t remember one specific thing but I have a kind of gag reel with about ten to twenty minutes of outtakes and that kind of stuff that happen on set that may probably be offered as bonus material on DVD/Blu-ray. 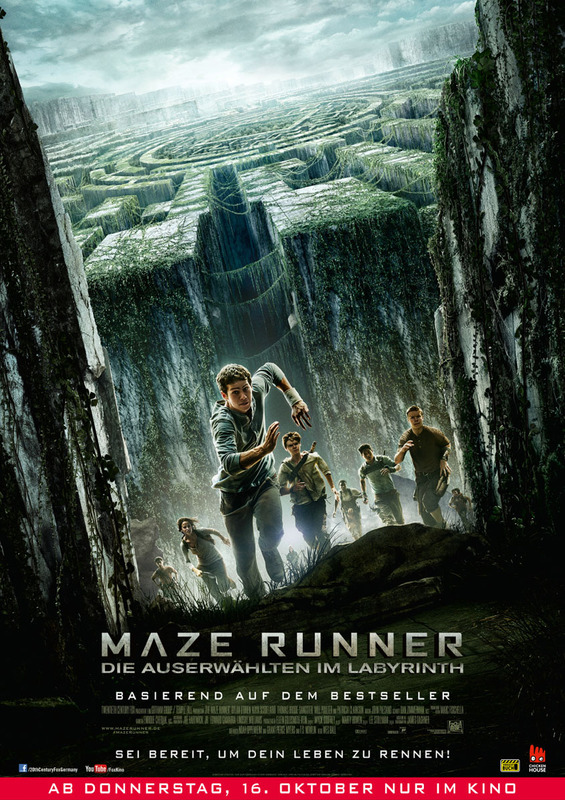 Maze Runner- Die Auserwählten im Labyrinth läuft ab dem 16. Oktober 2014 deutschlandweit in den Kinos (in 2D). Außerdem ist der Film in Dolby Atmos 3D-Sound zu hören. Weitere Informationen gibt es auf der offiziellen Film-Webseite. Die Fortsetzung Maze Runner 2, basierend auf dem Roman The Scorch Trials/ In der Brandwüste, ist für einen Start im September 2015 geplant.